Julia Falcone (’20) is working to correct systematic discrepancies in the distance measurements for RR Lyrae stars which become apparent when comparing new measurements obtained from the Gaia satellite to old ones obtained through the use of the Basse-Wesselink method and distance modulus (w/ Morrison). Steve Kerby (’19) is working on the connection between dark matter halos and their galaxy occupants. He’s searching for new ways to predict the number of central and satellite galaxies in a dark matter halo, and also helping with a new investigation on assembly bias involving galaxy colors and halo concentrations (w/ Zehavi). Darius Williams (’19) is modeling the non-axisymmetric rotation curve of the Milky Way. Axisymmetric approximations to galaxy rotation curves, such as double exponential profiles, have the benefit of being simple to analyze and compute with the cost of not fitting for perturbations due to features such as spiral arms. He is using observational data from the literature as well as python suites to build a realistic Milky Way model (w/ McGaugh). Darius is also implementing a version of ‘ubercal’ (Padmanabhan et al. 2008) for reducing stellar photometry in python (w/ Harding). 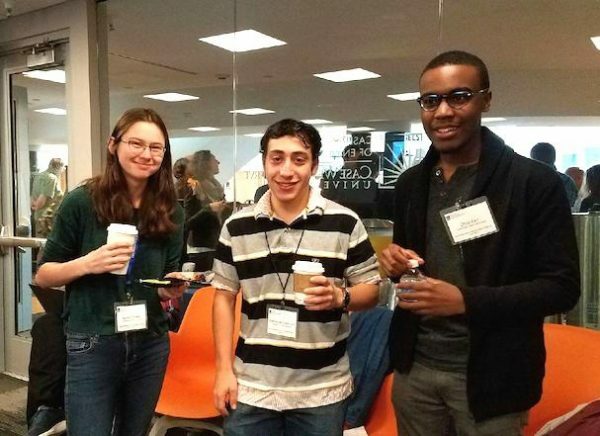 CWRU Astronomy undergraduates Kaelee Parker, Nathaniel Starkman, and Chris Carr attending CWRU’s international research conference on dwarf galaxies in Summer 2017. Chris Carr (’19) studied extremely low surface brightness dwarf galaxies in nearby galaxy groups using data taken with CWRU’s Burrell Schmidt telescope. He also studied the systematic uncertanties inherent in using red giant stars to measure distances to galaxies with Hubble Space Telescope data (w/ Mihos). Kaelee Parker (’19) is exploring the connections between uniformity and diversity in the rotation curves of galaxies using the SPARC database. These data show striking regularities like the Tully-Fisher relation, but what has been called diversity when queried in other ways. She is working to tie together these apparently contradictory strands of evidence (w/ McGaugh). Nathanial Starkman (’18) worked on the maximality of rotating galaxies – how much mass can be attributed to the stars without exceeding the limits placed by dynamical measurements. The maximality of galactic disks has long been debated, and is not even well defined. He is developing an algorithm to objectively quantify maximality (w/ McGaugh). Khalil Saleh (’17) analyzed 10 years of imaging data taken with CWRU’s Burrell Schmidt telescope to study changes over time in the night sky brightness at Kitt Peak National Observatory (w/ Mihos). Elizabeth Tarantino (’16) has worked on the measuring and modeling the kinematics of hydrogen gas in dwarf galaxies, which is an excellent tracer of the dominant dark matter component of these faint galaxies. As part of her work, she participated in the Green Bank summer school on radio astronomy run by the National Radio Astronomy Observatory. (w/ McGaugh, Lelli). Christopher Baumann (’16) designed and created a new planterarium show on cosmology which was presented at the Cleveland Museum of Natural History’s Shafran Planetarium (w/ Zehavi and Planetarium Manager Jason Davis). Andrew Loach (’18) used 8 years of deep imaging from CWRU’s Burrell Schmidt telescope to search for variable stars in the Milky Way (w/ Mihos). Sean Linden (’14) developed computer simulations of the interactions between the spiral galaxy M101 and its companion galaxies, studying the effects of encounters on the evolution of M101’s disk (w/ Mihos). Wesley Peters (’14) did his capstone work on the effects of different measures of rotation velocity and stellar mass on the Tully-Fisher relation. This empirical correlation is one of the strongest known in extragalactic astronomy; Wes’s work help to determine what measurements are best at minimizing the scatter. (w/McGaugh). Wes also conducted a feasibility study for using new SDSS-III data to investige the Fundamental Plane relation for early-type galaxies at a redshift of 0.5 (w/ Zehavi). Nathan Harmon (’14) studied the properties of green valley galaxies in the BOSS galaxy survey (w/ Zehavi). Lauren Nicholson (’12) investigated the nature of faint red galaxies in the Sloan Digital Sky Survey — galaxies that exhibit interesting clustering properties — using the Galaxy Zoo public classification database. (w/ Zehavi). Chelsea Spengler (’12) has worked on measuring the photometric and star forming properties of M101’s extended disk (w/ Mihos). Tom Connor (’11) developed techniques to correct deep imaging datasets for contamination due to internal reflections (w/ Mihos). Emily Joseph (’10) studied the connection between low surface brightness tidal features and intracluster globular clusters in the Virgo Cluster of galaxies (w/ Mihos). 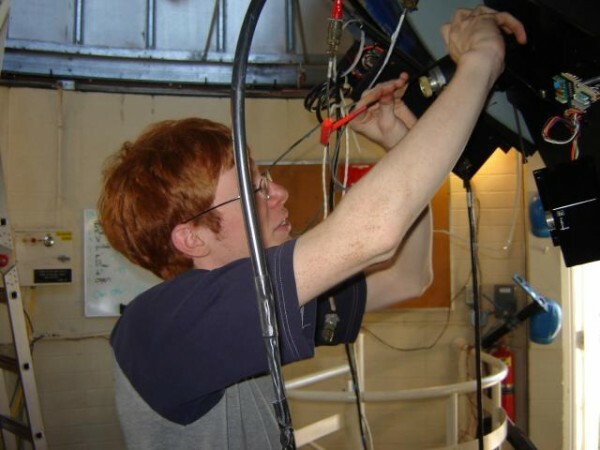 Colin Slater (’09) working on the Burrell Schmidt telescope at Kitt Peak. Colin Slater (’09) has worked on engineering upgrades to the Burrell Schmidt (w/ Harding), and developing new algorithms for quantifying and correcting the stellar point spread function and internal reflections on the Burrell Schmidt (w/ Mihos and Harding). Steven Janowiecki (’08) has worked on studies of intracluster light in the Virgo cluster (w/ Mihos). He has also been studying morphological properties of galaxies in the SDSS (w/ Zehavi). Lucy Frey (’08) used computer simulations to study the evolution of intracluster light (w/ Mihos). She also worked on the structure of the Milky Way, looking for streams of stars in its halo (w/ Morrison). Dave Starinshak (’07) worked on discovering and modeling star streams in the Milky Way halo (w/ Morrison). Andrew Schechtman-Rook (’07) worked on studies of the Milky Way using the SDSSII SEGUE database (w/ Morrison), and is currently studying the formation of intracluster light in N-body simulations (w/ Mihos). Stuart Robbins (’05) worked on the search for intra-group planetary nebulae in the nearby M81 group of galaxies (w/ Feldmeier). Colin Wallace (’05) has used computer models of galaxy mergers to probe how well kinematic tracers can describe the mass distribution of elliptical galaxies (w/ Mihos). 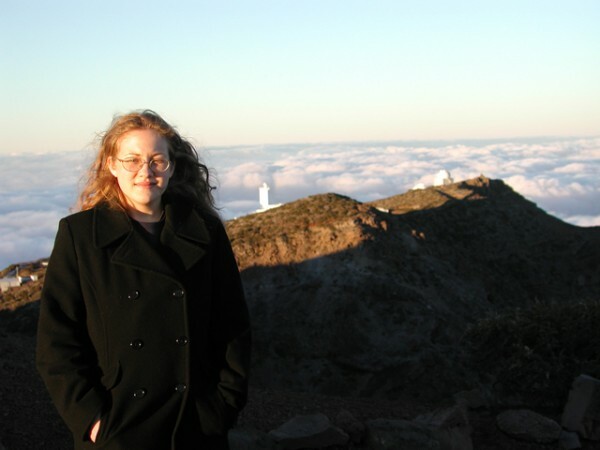 Stephanie Bush (’04) studied how the evolution of tidal debris in mergers of galaxies depends on the properties of the galactic disks and dark matter halos (w/ Mihos). She also worked for a summer with Dr. Eric Wilcots at the University of Wisconsin studying the gas distribution around dwarf galaxies. Bonnie Stayer (’04) at Las Campanas Observatory. Bonnie Stayer (’04) has used photometric data to determine the ages of the globular clusters in the disk of M31 (w/ Morrison). Steve Rodney (’03) has worked on imaging the intracluster light in galaxy clusters (w/ Morrison and Mihos). Amanda Kepley (’02) has done research on the longitudinal dynamics of particle accelerators at Fermi National Accelerator Laboratory with Dr. Chandra Bhat and on far-infrared polarimeters at University of Chicago with Dr. Roger Hildebrand. Nathan Kaib(’02) developed techniques to produce artificial images of galaxy cluster models in order to quantify the presence of intracluster light in galaxy clusters (w/ Mihos). Becky Stanek (’01) studied the properties dynamical models of triaxial galaxies with central black holes (w/ Mihos). She spent a summer at Space Telescope Science Institute in their summer student program, working for Dr. Torsten Boeker investigating the nature of nuclear star clusters in spiral galaxies. Jackie Monkiewicz (’98) worked on imaging the extremely faint light around nearby galaxies, in particular the stellar halo around the nearby galaxy NGC 5907 (w/ Morrison).